Perfect for travel, in the car, on the plane, and in the restaurant.TOYS MADE FOR TRAVEL: in the car, on the plane, and in the restaurant! They are easy to pick-up and take anywhere and everywhere. INFINITE PLAY CREATIONS: Tegu Travel Pals are magnetic wooden blocks that are the perfect toy for kids of all ages (0 – 99). Each set contains six magnetic wooden building blocks allowing the ability for endless fun. COMPATIBLE WITH ALL TEGU: Tegu magnetic wooden blocks are toys that encourage open-ended and unscripted play. The 6-Piece Tegu Travel Pals are a great starter set for entry into Tegu’s system of magnetic wooden blocks. They are compatible with all Tegu magnetic wooden blocks. SAFE AND BIODEGRADABLE: These toys are Natural Wood, with water-based finishes and recycled packaging. They are naturally safe: no lead, no plastic and non-toxic. Easy to clean and care for – simply wipe occasionally with a damp cloth. 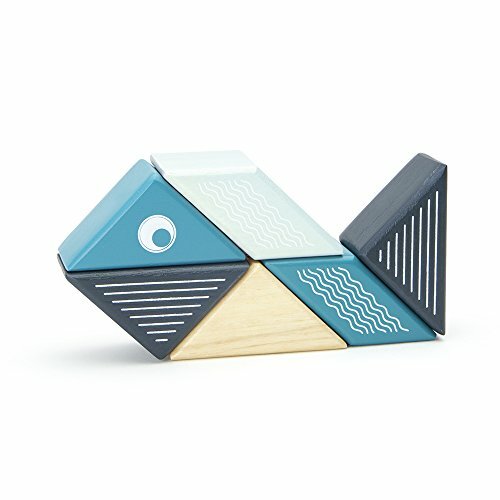 Tegu makes heirloom-quality toys. Designed in the USA, purposefully made in Honduras. NOT MADE IN CHINA. UNLIKE ANY OTHER BUILDING BLOCK: ‘Click-Clack’. It’s the iconic sound of two Tegu Blocks coming together. Tegu has reinvented the wooden block in a way that brings new life to a favored classic. By safely embedding magnets into each piece, Tegu Blocks become curiously attractive for both kids and kids at heart. No instruction manuals or electronics, just toys that demand imagination and inspire limitless creativity across all ages. These blocks have proven wildly addictive for kids (and kids at heart).